Don’t let dirty, blocked drains plague you for a minute longer than necessary. Call us today and we will send one of our highly experienced drainage engineers to your home or property straight away. We are well known in the area for the speed and efficiency of our unblocking service and our rates are among the most affordable you will find in Thanet. Whether your shower is filling with water due to a blocked drain or your factory forecourt is flooded because of accumulated debris in the drainage gullies, BP Drains can help. We have many years of experience and every member of our team is dedicated to ensuring that our customers enjoy the very best service in the Thanet area. Dependability – Come rain or shine, sleet or snow, our drainage engineers are ready to go to work with a smile. They genuinely enjoy the work that they do so it is very easy for them to provide a dependable service to our customers in the area. Experience – Every technician has a great deal of experience with the equipment they use on a daily basis. This experience enables them to clear a wide variety of domestic and commercial blockages quickly and effectively. Enthusiasm – We already mentioned that our technicians’ passion for the work they do makes it easy for them to turn up every day with a smile on their faces and provide our customers with a dependable service. It also ensures that they never quit before they have solved the problem you asked them to deal with. We are very proud of our reputation for clearing blockages that other firms could not manage. 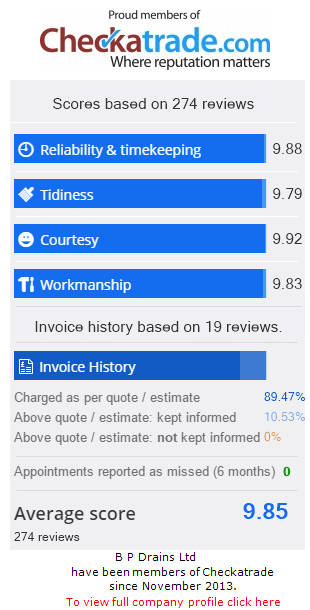 Honesty – We charge our customers the lowest prices possible, based on the actual work that we do. If it turns out that a blockage is significantly easier to clear than we had initially thought, our technicians will report this fact to the invoicing team and we will adjust our prices accordingly. We enjoy many repeat customers because of our fair pricing policy. If you would like to experience our affordable and highly efficient service for yourself, please do not hesitate to call us at any time of day or night. In addition to drain unblocking in Thanet, we are also able to complete simple or extensive drainage repairs at very competitive prices. Other services that we provide include our new home buyers surveys, where we use our CCTV equipment to inspect the state of underground drainage pipes in properties on which our clients are thinking of making an offer. Whatever your needs, call today and find out why so many local residents make us their first port of call.